WGG addresses a well-documented need to engage under-represented middle school youth, particularly females, in STEM. The benefits of increased STEM engagement include enhanced mastery and application of STEM concepts both in middle school and beyond, greater interest in pursuing advanced study in STEM areas and ultimately a better STEM prepared workforce. This project will also help middle school youth develop competences in the day-to-day application of STEM knowledge and thinking, as well as an increased awareness of the civic and social relevance of STEM. 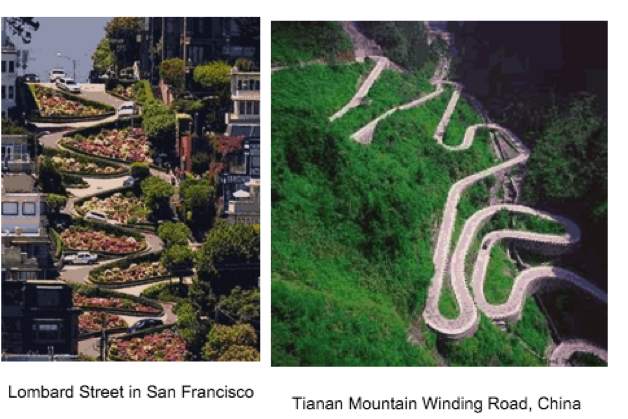 WGG is delivered through the WISEngineering environment; an innovative, open source, on-line learning environment that connects virtual design and physical modeling while also facilitating collaboration and community connections. This infrastructure is able to capture both individual and group interactions within design projects and allows for youth to record and share their design work, and thereby creates a much-needed and unique solution for informal learning and related research. Youth begin their design experience by completing virtual mini-challenges (Knowledge & Skill Builders) that scaffold the learning needed to complete the physical design challenges. Pictures, videos and multimedia links help youth develop their designs, gain an appreciation of the design challenge’s social relevance and increase youth an awareness of STEM related careers. The hands-on building and testing of the design challenge that follows the virtual activities is seamlessly connected with the computer-based work as youth virtually record and reflect upon their physical design work, uploading pictures and/or drawings of their designs. The Design Wall, a FacebookTM like sharing feature allows youth to share aspects of their design solutions and thereby facilitates collaborations. The threaded posting within the Design Wall provide a valuable tool for researchers to help understand youth development of engineering thinking skills. The on-line Design Journal and Portfolio also provide an ongoing record of youth work in WISEngineering. WGG is supported by National Science Foundation award DRL 1422436. 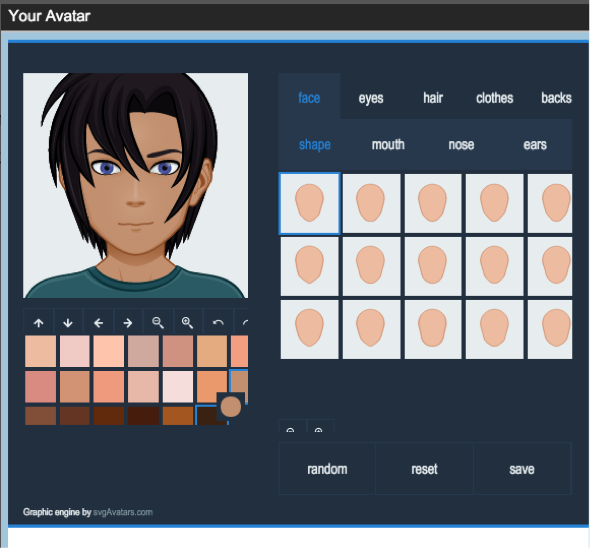 This is an introductory activity where youth design their own avatar, which they can revise whenever they wish. It has them use the WISEngineering environment, login and become used to the features. In this activity, children determined the best potato chip, introducing the concept of optimization. The idea of no correct answer, but an optimum one depending on your values, was challenging for many children who are used to uniqueness in STEM. Youth find that designing a simple speaker that they can use on their smart device is easy and introduces the concept of induced magnetism by an electrical current. Is All Slime Engineered Equally? Children investigate making slime using simple ingredients like water, borax and white glue. That glue can transform its chemical characteristics is explained with simple graphics and the participants go home with their own slime! Youth gain a much deeper understanding of prosthetic devices as they are challenged to create a prosthetic leg, which is attached to their knee. They gain much greater empathy for people who require prosthetic devices. In this challenge, children are provided with a tri-fold poster board and materials for making paths that a marble will go down. The goal of the activity is to design a path that takes the longest for the marble to move from the top to the bottom of the board. Youth develop much deeper understandings of friction, potential and kinetic energy. In this activity children learn about structural design and in particular using only two pieces of paper, a few index cards and a small amount of tape, they are able to create a structure that will support many text books. A performance factor is presented so there are trade-offs to make in creating the design. 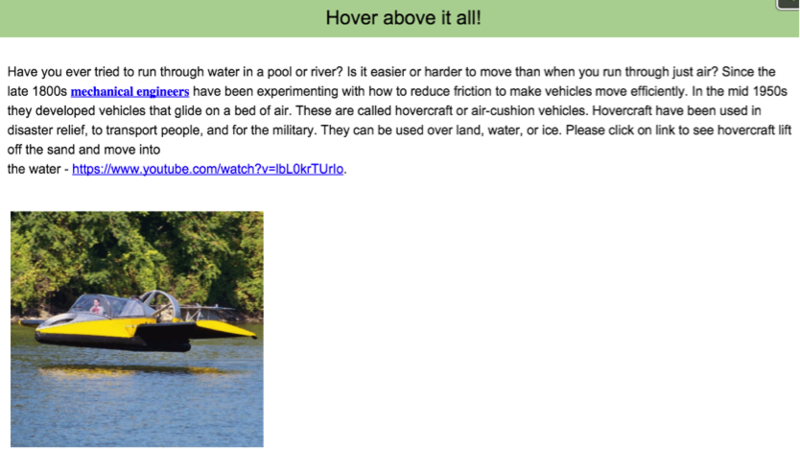 Youth learn how hovercraft function and apply this knowledge as they create their own hovercraft and test them against one another. 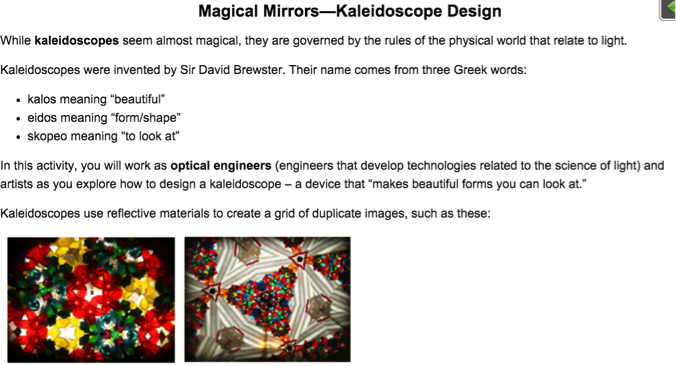 Kaleidoscopes have a magic to them, how simple beads can be transformed into colorful, reflective images is at the heart of this activity as youth make their own kaleidoscope, which they can bring home, learning about optics along the way. Children learn about programming in this activity that challenges them to design in ScratchTM two dancers with coordinated moves. They often include music and other enhancements as they grasp the easy to features of this programming language. 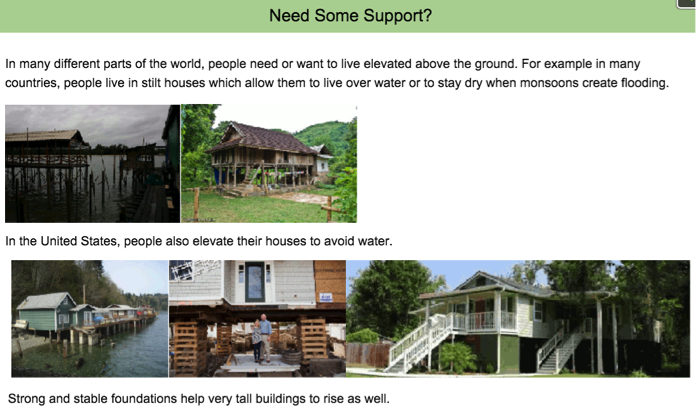 Safe, fresh water is not available in much of the world. 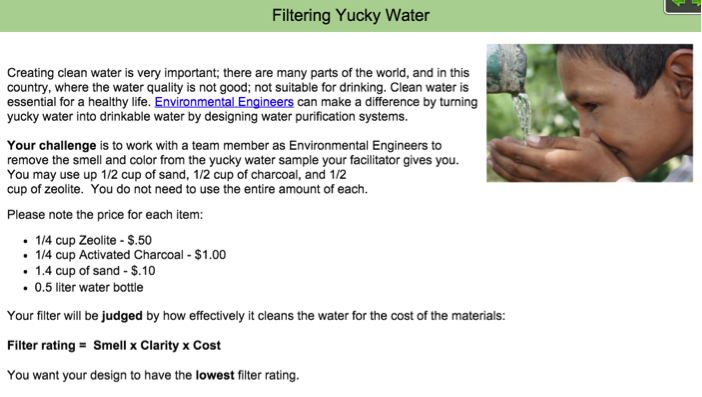 Children are challenged to filter water that smells and is discolored. Their filtering system is assessed based on its overall effectiveness, a defined criteria. Today your and your partner need to draw on your engineering skills to save your lives! The airplane that you were travelling in has crashed in rugged, mountainous terrain. Fortunately you survived with just a few bumps and bruises. Unfortunately, during the tumultuous descent one of you have lost a shoe. You will need to design a shoe (a WuGG) with the materials you have available so that you can walk down the mountain to safety. Children hone their design skills as they create a solar cooker to make S’mores. In the process they learn about solar energy, angles of reflection and the value of solar energy in developing countries where it can be used as a fuel source. n this activity children apply their knowledge of chemical reactions, learned by using Alka Seltzer to pop the top on a film canister, the motive force for the rocket. They also learn about rocket stability with use of fins to stabilize the rocket’s movement. A great summer activity where children design an arcade game that uses squirting water from a pressurized container to knock over bottles, move containers and try to avoid each other! The ability to write rules so others can play the game, as well determining the optimum water for the container are features of the activity.